Get ready to take on the world with the Moscow artist’s mix of moody synths and pulsing techno. 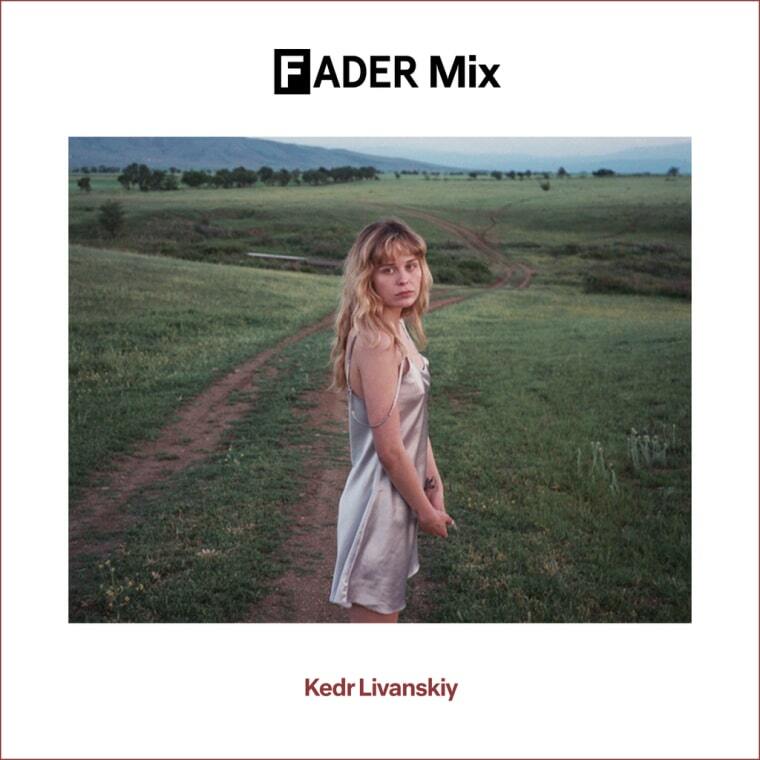 The electronic music of Kedr Livanskiy is always shifting. In any given song, the Moscow-based producer is likely to switch gears from billowy ambience, to churning club rhythms, to reverb-drenched Russian vocal hooks which will noodle around your head for days. I love the bright, swirling melodies of her 2015 track “No More Summer Rain,” which would sit neatly on a playlist alongside tracks from pop experimentalists like Maria Minerva, James Ferraro, or U.S. Girls. Following her great January Sun EP a couple of years back, she’ll release her playful debut album Ariadna this September 15 on Mike Simonetti’s label 2MR, where her foregrounded singing plays off against her characteristically eccentric influences, from Italo synths to jungle beats. Livanskiy’s kinetic FADER mix is like a one-stop-shop for the discovery of electronic rarities — she opens with dark pulsing techno from Swedish producer Varg, before bringing in twinkling textures from Finnish artist Mono Junk, a scary Coil sample, and wraps things up with Moscow’s Buttechno. Dive in below, and read on for Livanskiy’s guide to the other artists you need to know in Russia’s young electronic scene. I'm in Moscow, and around me are my friends and music. I think this mix is cool to listen to and be charged up for aggression. I wrote it in this state, and it takes your energy and allows it to transform. And in the end you let go. I think it needs to be listened to in urban spaces, plugging the ears with headphones so as not to hear the stupid conversations of passers-by, and not reacting to what is happening around. Confront the world, with music as your weapon. I spent my childhood in the village with my grandmother and in those days there was a strong folklore tradition in the villages. So I grew up listening to folk songs, as well as music from my parents like Russian rock, and local analogues of Joy Division and The Cure. It’s evolved from punk and all its varieties, through synth-pop and synthwave, to techno, house, and ambient. Now, I listen to a lot of experimental music and noise. But these preferences weren’t very much reflected in this mix — in 30 minutes, I wanted to make it biting and moving, like the sound of the city. The past year I’ve gotten really interested in krautrock, and their approach. I’ve watched almost all the documentaries on it. How would you describe the electronic scene in Moscow to someone unfamiliar with it? It’s only just being formed, and everything that is still being formed is like a child. The child is still fresh and naive, and he is looking for some new solutions. Such joy is present from this — everything is just beginning. I noticed that you included Buttechno, a Moscow artist, in your mix. Which other Russian artists should we know about right now? A lot of releases from the label Gost Zvuk, like Flaty, Lapti. Others I like are Burago, and Jeff Boomhauer and the artists on Mississippi Landscapes. Later this year, you're releasing your debut album. Could you tell us a bit about the creative process behind it? I wrote all of my last album in Ableton. For this album I started using synthesizers — they help me feel the present moment, and be more present during the creative process. For me, this interaction is more raw and sacred than actually mixing the track down, which seems like mere formalism in comparison. In general, I’d like to exercise more freedom and depart from a dance format in the future — though of course most of this album came out in a dance vein. “Mermaid” and “Sad One” are forays in this direction…balladic, even. I’m just reading this book now: Meet Werner Herzog. The director talks about how much the process of his work stitches with his life — this is real magic. It’s a metaphysics of life and creativity, where one is already intertwined in the other. This is not a story about how a person worked a film, came home to his family, and the film ended. No, he finished the film, came home, and already on the way home, the thought of a new film begins. For me, he’s an example of a real creative person.